Use render proxies with mental ray rendering to manage large scenes with complex geometry. Export your complex object as a mental ray assembly file, then replace it in your scene with a placeholder object that references this file. When you render, the exported object is loaded into memory and rendered with the rest of your scene. Translation time and memory usage are cut down, allowing mental ray for Maya to render large scenes. Using a linear workflow always requires some gamma correction somewhere. If its within a maya shader network then you have some choices. The most obvious is maya's standard gammaCorrect node. 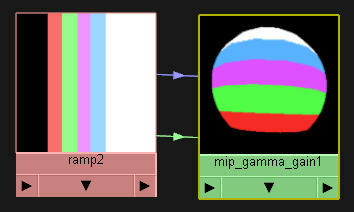 If you have maya2008 or 2009 then there is also mentalray's mip_gamma_gain node (which is hidden by default, but is easy to expose). These two nodes perform the same basic function, with a few differences. 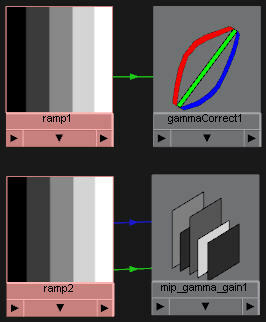 Maya's standard gammaCorrect enables independant gamma control of the three color channels. 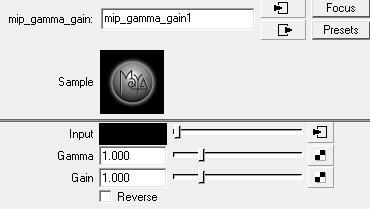 While mr's mip_gamma_gain offers the simplicity of a single value gamma and throws in a gain control and a reverse switch for inverting the gamma value (saves you having to get the calculator to figure out the inverse of 2.2). Until very recently, I had always used maya's gammaCorrect. And for one reason only - I like its colorful and meaningful hypershade swatch because it is easy to see in a busy hypershade window. 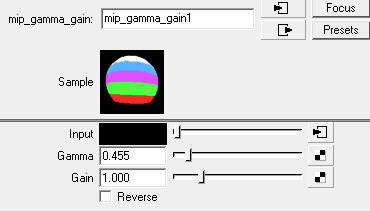 Now I'm starting to use mip_gamma_gain instead because it occured to me that I can modify mentalrayCustomNodeClass.mel ( in C:\Program Files\Autodesk\Maya2008\scripts\others) and get it to display a swatch that has one of those updating shader balls. That means I can see the actual result of the gamma change. Although it makes the gamma nodes harder to find in the hypershade window, I'm finding the visual feedback useful. If you want to try this, make a copy of mentalrayCustomNodeClass.mel into your local scripts folder and edit your local copy. The file has an obvious structure, so look for the "Internal MentalRay Nodes" section and add these lines after it. You should also comment out the original reference to mip_gamma_gain. Last month I wrote about how I implement a linear workflow in my work. Since then I have noticed that in at least one area I'm doing it differently to many others - and now I know why they are right and I was wrong. It boils down to this: I've been leaving my frameBuffer gamma at 1 (the maya default) and setting my output gamma to 2.2 via an exposure node, which means I need to degamma my 8 bit fileTextures (but 32 and 16 bit floats are ok). However the other (very popular) approach is to set the frameBuffer gamma to 0.455, and the output gamma to 1, which means generally the fileTexture requires no degamma.